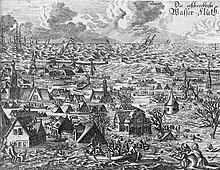 Contemporary pictur o the fluid that struck the North Sea coast o Germany an Denmark in October 1634. A fluid is an owerflow o watter that submerges laund which is uisually dry. The European Union (EU) Floods Directive defines a fluid as a coverin bi watter o laund nae normally covered bi watter. In the sense o "flowin watter", the wird mey an aa be applee'd tae the inflow o the tide. This page wis last eeditit on 24 Mairch 2017, at 21:32.